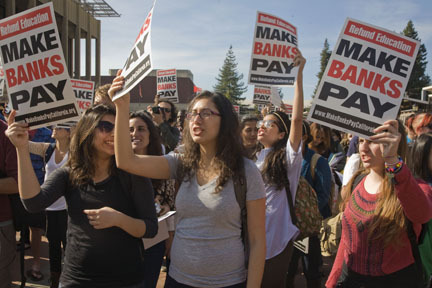 Last week’s ReFund California demonstrations at University of California and California State University campuses drew thousands of participants, and students and workers are gearing up for more. The actions are aimed at the corporate elite who make up a majority of the two system’s governance systems, calling on them to support ballot initiatives and legislation to fund education by signing this pledge. Berkeley’s independent student newspaper, the Daily Cal, reported that the two largest, UC Irvine and UC Berkeley (where protestors voted to establish an Occupy Cal site), drew thousands of participants each. At UCLA, twelve students were arrested after they shut down a section of Wilshire Boulevard. UC Berkeley officials are under fire for their handling of the protest, as videos taken at the scene show police charging into lines of demonstrators on the very spot where the Free Speech Movement was born in 1964. Thirty-nine protestors were arrested after they linked arms and refused to disperse, including thirty-two students and one professor. In a public letter, Berkeley chancellor Robert Birgeneau and other officials offered their regrets and promised an inquiry, but claimed protestors’ linking of arms was “not non-violent civil disobedience.”Late today, the chancellor issued another statement calling the police actions “disturbing” and granting amnesty to some of the Berkeley students arrested. The chancellor's position has drawn widespread condemnation from the campus community and beyond. So far, over 1600 UC Berkeley faculty and graduate instructors have signed an open letter saying they are “outraged by the unnecessary and excessive use of violence” and calling on the administration to “put an end to these grotesquely out-scale police responses to peaceful protest.” The American Civil Liberties Union expressed its “grave concerns” in a letter to UC officials. Citing excessive force and free speech violations, the Berkeley City Council ended its mutual assistance arrangement with the UC Berkeley police by a unanimous vote. Other protests have come from veterans and historians of the Free Speech Movement, UCB’s Graduate Assembly, the parent of a UCB student, and even television personality Steven Colbert. November 15 and a long list of groups representing students, faculty and staff (including UPTE-CWA) have issued this statement of support. Classes will be taught outside, along with a noon time rally, followed by a 2:30 pm march and 5 pm assembly on Sproul Plaza. UCB faculty member Robert Reich, a former US Secretary of Labor, has agreed to move his previously-scheduled 8pm Mario Savio memorial lecture onto the steps of Sproul Hall in order to be a part of Tuesday’s strike. Students and employees at all UC and CSU campuses are also going ahead with “ReFund California” actions planned for Wednesday, November 16, including teach-outs and rallies. A list of UC campus events is here. 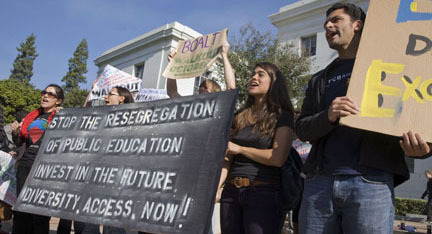 Protests at the UC Regents’ meeting in San Francisco and the CSU Trustees meeting in Long Beach are also planned, but news has just broken that UC has suddenly cancelled its meeting. In other news, UC plans to ask the Legislature for $2.8 billion next year, $430 million more than it received this year, but still short of the $3 billion UC students paid in tuition and fees. UC has not yet decided whether student tuition will increase again. The Los Angeles Times called the proposal a “tactical retreat” by Mark Yudof following the outcry from September’s announcement of substantial fee hikes over the next four years. Yudof said fees would not go up even if state budget cut triggers are pulled next month. State controller John Chiang reported that revenues for the first four months of the fiscal year are $1.5 billion behind, while expenditures are $1.7 billion ahead, of what was projected. Triggers kick in if the state is $1 billion to $2 billion short. CSU tuition could rise by 9% next year if the state doesn’t come through with the money that system needs. CSU faculty are planning a one-day strike on Thursday, November 17, over cancelled pay raises and stalled bargaining. The New York Times notes that unlike UC officials, some college administrators have been downright “hospitable” to occupations. The state’s Legislative Analyst’s Office writes that Gov. Brown’s proposals for public employee pensions “would shift more of the financial risk for public pensions -- now borne largely by public employers -- to employees and retirees.” At the same time, it said that making substantial changes to current benefits is almost certainly illegal. In national developments, Ohio’s voters supported collective bargaining rights for public employees by a wide margin, and tomorrow activists in Wisconsin launch a recall against Governor Scott Walker, who tried to undermine public workers’ rights there.